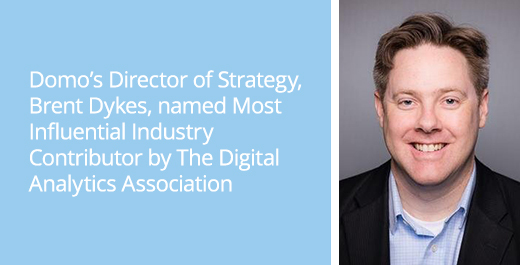 SILICON SLOPES, Utah – April 19, 2016 – Domo today announced that Brent Dykes, its newly appointed director of data strategy, has been named the Most Influential Industry Contributor as part of the 2016 Awards for Excellence by the Digital Analytics Association (DAA). The Awards for Excellence program recognizes individuals and organizations whose efforts have influenced, contributed and strengthened the field of digital analytics. From a pool of 25 nominees, five finalists were selected for the Most Influential Industry Contributor category, which Dykes went on to win. With more than 15 years of enterprise analytics, digital marketing and consulting experience, Dykes has brought a wealth of knowledge and practical skills to the analytics industry. He is currently a strategic member of Domo’s consulting organization. Dykes has leveraged years of hands-on experience and a knowledge of industry best practices to help customers get more value from their data through Domo’s Business Cloud. Dykes was chosen for the award for helping change the way professionals think about common practices, simplifying common tasks and improving results, being a role model and mentor and inspiring others to achieve more. He has written and been cited in several analytics-influenced articles and books, presented at numerous events, conferences and webinars and provided guidance to industry members and the DAA. In addition, Dykes is a regular contributor on Forbes.com. More than 80 nominations were submitted for the 2016 awards, and the finalists were determined earlier this year by votes from the DAA members. Ultimately, award recipients were selected by a panel of distinguished independent judges who represent all sectors of the digital analytics industry. The full list of winners can be found here: http://www.digitalanalyticsassociation.org/awardrecipients2016. The Business Cloud and Domo are trademarks of Domo, Inc.